Conditions: fine, approx 18 degrees! 1 Oliver Stanesby 7:38	 M 17 Pure Blonde Beers-2.23, Mile 5.15! very consistent splits. 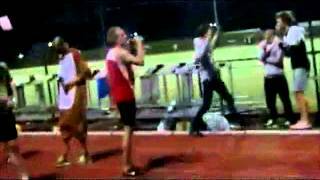 Great first beer mile attempt from the ex runner! 2 Josh Harris 8:22	 M 18 Carlton Dry Beer- 3.58, Mile 4.24. Consistently quick running, needs improvement on beers. Will learn from experience as it is his first beer mile! 3 Paul Luttrell 9:08	 M 19 Tooheys Dry Beer- 3.34, Mile 5.34. 15 sec 1st beer. Went out too hard. Blew up with a 95 sec last lap. Was on for National record after 1/4 mile! 4 Callum James DNF	 M 19 Crown Lager Struggled! Through half way in 6.11, 3rd beer had taken 4 mins before pulling out! good experience for the animal! Bridport Beer Mile held at the end of season training/beers camp in Bridport, Tasmania on the 11th of April!